Friends, I'm creeping out from the writing tower to blog. Don't tell my agent. The fourth Bone Season book is well underway, and things are about to take a very dark turn for Paige. I've also just hit the huge milestone of 150K on The Priory of the Orange Tree, which is not only about dragons, but turning out to be the size of a dragon, too. I was initially worried that it might be difficult to work on two projects at once, but to my endless relief, it's actually proving much easier than I expected. If anything, it's just making it hard to focus on doing real-life admin, as I'm either deep in the political web of Scion or navigating a dragon-infested world. Currently I'm swinging between the manuscripts on a week-by-week basis, although I will be prioritising TBS4 towards the end of the year, as I want that to be finished and ready for my editor in good time. Anyway, back to books that are a little closer to publication . . .
First of all, you can now read the prelude of The Song Rising on one of several blogs, including this one. Prepare to be scandalised – betrayal runs deeper than you think. Second – The Song Rising might not be out until March 2017, but now early proof copies are making their way into readers' hands (! ), I think it's time I gave you the tools to get straight back into the world of Scion. The first refresher I've written up is a recap of The Mime Order, so you can get up to speed ASAP. You can either go with the quick guide, which will tell you everything you strictly need to know before The Song Rising, or get your teeth into the more detailed summary below it. An updated character guide will follow soon. For more memory-joggers, here's a little refresher guide from last year. Paige Mahoney has won the scrimmage and is now Underqueen, with command of the clairvoyant syndicate in London. She now intends to turn the organisation into an army capable of resisting Scion. Having been betrayed by his mollisher, Jaxon Hall has gone to the Rephaim. The syndicate is now allied with the Ranthen and is known as the Mime Order. The grey market – the illicit trade in voyants between certain mime-lords and Scion – has been disbanded, but its leader, the Rag and Bone Man, has escaped justice. The Seven Seals are divided. Nadine and Zeke have remained loyal to Jaxon, while Eliza, Danica and Nick have chosen to ally with Paige. Warden and Paige have not yet decided whether to pursue a relationship. During the first rebellion against the Sargas, twenty years before the events of The Bone Season, a human betrayed Warden and the Ranthen, resulting in their torture and the deaths of all of the other prisoners. Senshield, a technology capable of detecting the first three orders of clairvoyance, will be introduced to London more widely in 2060, and will be used to curb voyants' access to essential services. After leading a successful rebellion against the Rephaim in The Bone Season, Paige Mahoney returns to London with her gang, the Seven Seals, and the survivors from Sheol I. They are forced to enter the capital through the heavily-guarded Tower of London, resulting in the loss of most of the survivors. For several days, Paige, who quit her job with Jaxon Hall at the end of The Bone Season, goes into hiding to recover from her injuries. The other survivors – including Ivy – are staying in Camden Market with a shopkeeper named Agatha, who used to employ Ivy. The survivors have different views on what to do next. Ivy is particularly unwilling to speak out about their experience in the colony. Her reluctance partly stems from her fear of the Rag and Bone Man, the local mime-lord, who she claims is particularly violent. Paige is cornered by Haymarket Hector, the Underlord, who mocks her request for an audience and wants to know where she has been for the last six months. When she refuses to answer, Hector allows his cronies to beat her. Paige drags herself to the voyant literary community of Grub Street. Upon arrival, she meets Alfred. He was responsible for selling Jaxon's controversial pamphlet, On the Merits of Unnaturalness, to Grub Street's publishing house, the Spiritus Club. In order to earn back her voice in the syndicate, and to ensure she has protection from Scion, Paige reconciles with Jaxon. While he is sympathetic to her desire to tell the world about the Rephaim, he requires her total commitment to her work as his mollisher. After an altercation at the black market, Paige discovers that Haymarket Hector and his gang have been brutally murdered. The only one missing is Cutmouth, Hector's mollisher. A meeting of the Unnatural Assembly is called to discuss Hector's death. The syndicate has been temporarily taken over by a mime-queen named the Abbess. Paige tries to use the opportunity to tell the Assembly about the Rephaim, but Jaxon stops her and blackmails her into silence. After the meeting, Jaxon announces to the Seven Seals that he intends to partake in the scrimmage, an event in which candidates will fight for the position of Underlord. Paige comes up with the idea of writing a penny dreadful – a cheap horror story – about the Rephaim, which will put the idea of them in the minds of voyants. The other survivors agree to write it. Later, Paige is accosted by two Rephaim, Terebell Sheratan and Errai Sarin. They want Paige to find Warden, her ex-keeper, using her spiritual link with him. She traces him to the Rag and Bone Man's den, where he is being held captive. Although she will never forget that he used her as a cat's-paw to engineer the revolt in the colony, she agrees to work with him to bring down Scion and the Sargas. Paige convinces Alfred to pitch the penny dreadful, The Rephaite Revelation, to the Spiritus Club. He is successful in selling it to them, but warns that there will be a steep price. Terebell agrees to give her money if she will win the scrimmage and ally the syndicate with the Ranthen (Rephaim who do not support the rule of the Sargas family). Paige agrees, but adds that she will need continued funding from the Ranthen in order to remodel the syndicate into an army. Terebell grudgingly agrees to provide it. The Rephaite Revelation spreads across London. When she gets hold of a finished copy, Paige discovers, to her dismay, that it has been edited to remove information about the Rephaim's weaknesses and to make them seem like godlike saviours. Alfred tells her that Felix called him with instructions to edit it in this manner, which makes Paige concerned about the safety of the other survivors. She discovers a secret doorway in Agatha's shop that leads to the Abbess's night parlour in I-2, where the other survivors are being held captive. The Abbess, who killed Hector, is now after Cutmouth. Paige quickly works out that Cutmouth is hiding in the Jacob's Island slum, where the vile augurs – the pariahs of the syndicate – are kept isolated from the rest of the voyant community. She is too late to stop the murder, but before she dies, Cutmouth tells Paige that the Abbess has a Rag Doll tattoo, proving her link to him. She also whispers that there is a ‘grey market’ in London. One of the other vile augurs, Wynn Jacob, witnessed the assassin coming to the slum. Paige invites her to the scrimmage to testify and convinces the Ranthen to rescue Ivy, who grew up with Cutmouth and may know exactly what the grey market is. During the scrimmage, Paige and Jaxon fight as a team in the Rose Ring and defeat all of their opponents. As Jaxon is about to be named Underlord, Paige challenges him for the crown. He comes extremely close to defeating her, but she is able to best him at the last minute by possessing him and forcing him to issue a surrender. Jaxon leaves, warning Paige that he will find other allies. Having been rescued, Ivy tells her story. She was mollisher to the Rag and Bone Man, who was selling voyants to Scion. Several mime-lords and mime-queens, including Hector and the Abbess, were involved in this trafficking ring. When she tried to expose it, the Rag and Bone Man sent her to the colony along with those she had helped put there. Her corruption exposed, the Abbess tries to kill Paige, but is shot dead by other members of the Unnatural Assembly. Now Underqueen, Paige decrees that the new incarnation of the syndicate will be called the Mime Order. 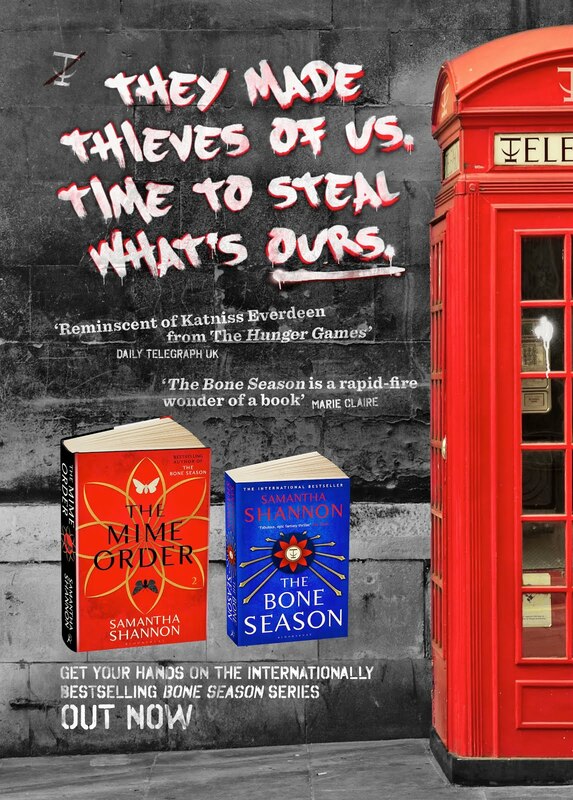 The transmission screens across London begin to show another three Bone Season survivors awaiting execution. They will only be spared if Paige surrenders within the hour. Paige decides to go to the Archon in a stolen body to barter with Nashira Sargas for their lives. Because she has not come in person, however, the survivors are executed. Paige threatens Nashira with war and advises her to find some new friends now the grey market has been exposed. Nashira cryptically replies that she has an old friend, who has returned to her after twenty years of estrangement. The friend reveals himself – Jaxon. Throughout The Mime Order, Scion continued to curb the free movement of voyants with additional security. It is rumoured that Senshield, the only technology that can detect aura, will be installed on a much wider scale in the New Year. And thank you so much for linking to my little blog. I'm very happy to be sharing the love for this series.